Europe’s biggest trailer maker is celebrating the 20th anniversary of exports to Norway – with a 25 per cent increase in sales. Ifor Williams Trailers are planning for even more growth in the Scandinavian country by adding another five distributors to their network in 2015. The news was revealed during a visit to North Wales by the main Norwegian distributor, Nils Duenger, and the sub-distributors. They were taken on a guided tour of the company’s factories in Cynwyd, Corwen and Deeside. Nils, who is based in Rudshogda, 150 kilometres north of Oslo, recalled the link with Ifor Williams Trailers dates back to a visit by him to the Royal Highland Show in Edinburgh. He was the first Norwegian farmer to import Highland cattle and spotted the firm’s livestock trailers at the show – and a great business opportunity. Nils said: “We didn’t have anything like this in Norway at all and they are solid with parabolic leaf springs for suspension. The trailers are durable and known for their quality. 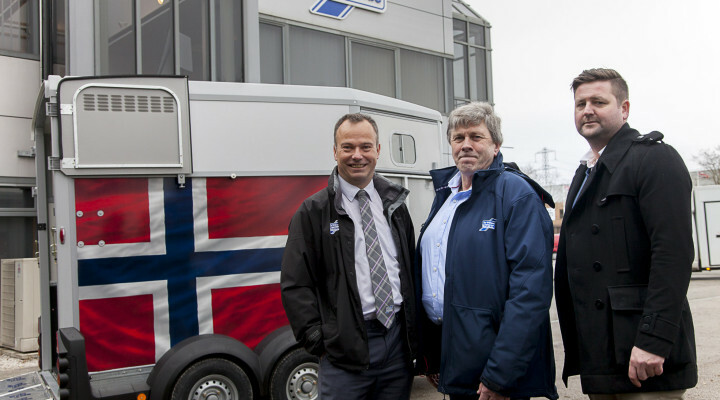 Peter Nesbitt, the Business Development Manager at Ifor Williams Trailers, is delighted with how things are going in Norway. He said: “We’ve greatly expanded the network there and grown sales in Norway by 25 per cent over the past 12 months. “It’s very encouraging and we’re confident that the sales growth will continue at a fast pace in the coming years in a country that understands and appreciates the value of the high quality trailers that we produce. “Nils is our main importer and he’s established a network of 10 covering all of the major population centres in the country. “As the network continues to expand so will our sales. One of our distributors has even managed to sell a trailer on to Svalbard which, at a latitude of about 80 degrees north, is as close to the North Pole as we’ve ever had a trailer. “Norwegians definitely appreciate robust build quality and our trailers certainly fit the bill because they are sturdily built and so reliable. “The home market for trailers is also buoyant and we have enjoyed strong growth in 2014. “We’ve seen growth in all of the products, commercial trailers especially but also in the equine and farming sectors. Among the sub-distributors who accompanied Nils was Henrik Been who is based in Moss, south of Oslo. He said: “I’ve been a distributor for four years. I already sold trailers and I had a customer who really wanted one made by Ifor Williams Trailers and he didn’t want to buy anything else. “The reason the trailers are so popular is because the quality is so good, that’s the main thing. “I am very impressed with the factory and the way they do things. They are very professional and it is clear why the quality is so high.